About a month ago I was having a conversation with a girl I go to church with about cleaning products. I think it started with her asking me what my favorite was. I didn't know. I've been trying to make a conscious effort in buying more Eco Friendly products for my home. At this point I had tried Palmolive Eco+ dishwasher detergent and wanted to cry. I had more hard water stains than I have ever seen in my life on my beautiful clear glass dishes. I really did not know how I could salvage them. I thought I was going to have to throw them in the trash and get new ones. It was that bad! As I relayed this to her she mentioned that I should try a product called Lemi Shine. I tried it and it is amazing! Seriously the best product out there! I don't know if it is eco friendly but if it makes my dishes look brand new then I'm going to use it. 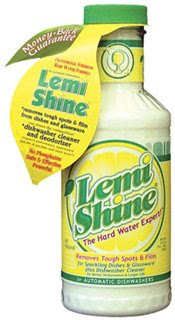 So if you are frustrated with hard water build up I promise you Lemi Shine will work! What are some of the cleaning products you can't live without? P.S. If you have stainless steal appliances did you know that you can use Pledge to clean them? It leaves them looking fabulous with a nice sheen. A little trick I picked up working for a house cleaning company in college. Bailey you are so awesome, can I just say I LOVE your blog. I am dying with hard water stains, I am going to go get some tomorrow!